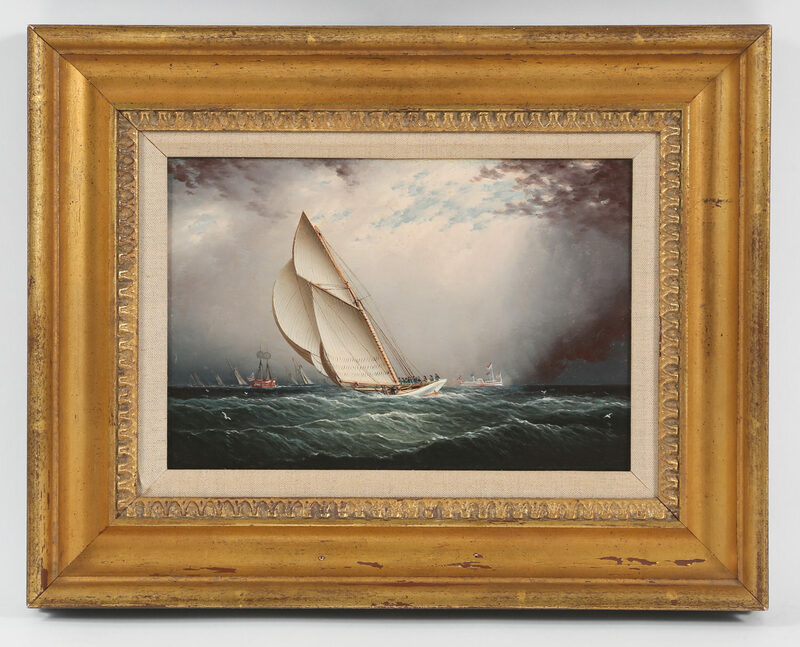 Likely the son and pupil of Thomas Buttersworth, a painter of sea battles, James Edward Buttersworth (British/American, 1817-1894) made his way to Hoboken, New Jersey in the late 1840’s and kept a studio in the Brooklyn borough of New York. In the mid-1850’s Buttersworth exhibited with the American Art Union of New York. The Terra Museum of American Art in Chicago held a notable retrospective of his work in 1994 titled Ship, Sea, and Sky: The Marine Art of James Edward Buttersworth. The painter was known for his ability to render precise detail and for deliberately stretching the length of the hulls and sails of his vessels to create lively and full of motion maritime scenes as is particularly noticeable here. The technical prowess shown by Buttersworth in creating such a climactic scene whereby the Volunteer appears to shield itself from the threatening skies by capturing the incoming light above is testament to the painter’s mastery of the use of light and his highly developed sense of composition.